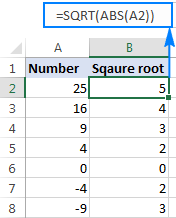 The tutorial shows how to do square root in Excel as well as how to calculate Nth root of any value. Squaring a number and taking a square root are very common operations in mathematics. But how do you do square root in Excel? Either by using the SQRT function or by raising a number to the power of 1/2. The following examples show full details. Where number is the number or reference to the cell containing the number for which you want to find the square root. 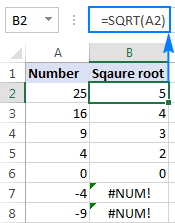 If a number is negative, like in rows 7 and 8 in the screenshot above, the Excel SQRT function returns the #NUM! error. It happens because the square root of a negative number does not exist among the set of real numbers. Why's that? Since there is no way to square a number and get a negative result. When calculating by hand, you write square root by using the radical symbol (√). 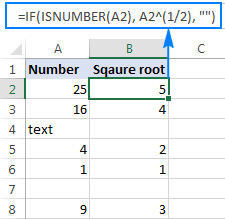 Though, it's not possible to type that traditional square root symbol in Excel, there is a way to find square root without any function. For this, you use the caret character (^), which is located above the number 6 on most keyboards. In Microsoft Excel, the caret symbol (^) acts as the exponent, or power, operator. For example, to square the number 5, i.e. raise 5 to the power of 2, you type =5^2 in a cell, which is equivalent to 52. For example, to get the square root of 25, you type =25^(1/2) or =25^0.5 in a cell. Why is an exponent of 1/2 the same as square root? For starters, what do we call a square root? It is nothing else but a number that, when multiplied by itself, gives the original number. For example, the square root of 25 is 5 because 5x5=25. That is crystal clear, isn't it? So, 25½ is equivalent to √25. The POWER function is just another way to perform the above calculation, i.e. raise a number to the power of 1/2. Where number is the number you'd like to find the root of and n is the root. Instead of fractions, you can use decimal numbers in exponents, of course if the decimal form of the fraction has a reasonable number of decimal places. For instance, to calculate the 4th root of 16, you can go with either =16^(1/4) or =16^0.25. Please notice that fractional exponents should always be enclosed in parenthesis to ensure the proper order of operations in your square root formula - first division (the forward slash (/) is the division operator in Excel), and then raising to the power. Tip. To perform multiple calculations with a single formula like in the above example, fix a column and/or row reference where appropriate by using the dollar sign ($). For more information, please see Why use dollar sign in Excel formulas. This is how you can do square root in Excel. I thank you for reading and hope to see you on our blog next week! 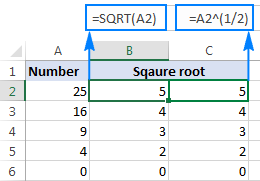 3 Responses to "How to square root in Excel: SQRT function and other ways"
Hi Svetlana, Please let me know how VBA coding for Index and match function from different sheet. Thanks! I have a situation , where I need to calculate the calls made between certain time by an helpdesk agent. Example; Agent X make some calls during his 8 hours duty time from 8:am to 4 Pm. I want to the formula to calculate calls made between 11: am to 1pm. Can you combine functions like power & sqrt, if so can you provide an example. The reason i am asking I and trying to find the Slope Factor of a roof. I use this formula in paper and would like to use Excel.